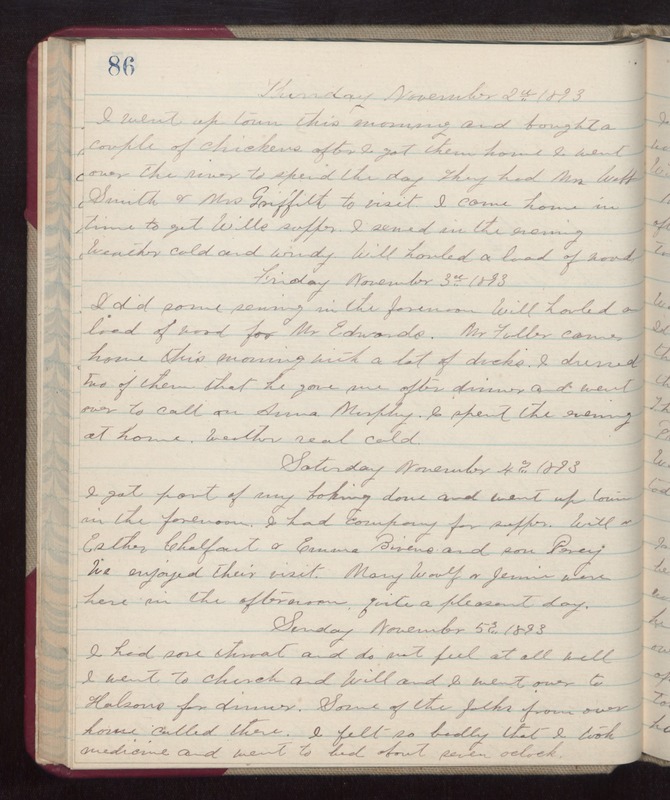 Thursday November 2nd 1893 I went up town this morning and bought a couple of chickens after I got them home I went over the river to spend the day. They had Mrs Webb Smith & Mrs Griffith to visit. I came home in time to get Wills supper. I sewed in the evening. weather cold and windy. Will hauled a load of wood. Friday November 3rd 1893 I did some sewing in the forenoon. Will hauled a load of wood for Mr Edwards. Mr Fuller came home this morning with a lot of ducks. I dressed two of them that he gave me after dinner and went over to call on Anna Murphy. I spent the evening at home. weather real cold. Saturday November 4th 1893 I got part of my baking done and went up town in the forenoon. I had company for supper. Will & Esther Chalfant & Emma Bivens and son Pevey. We enjoyed their visit. Mary Woolf & Jennie were here in the afternoon. quite a pleasant day. Sunday November 5th 1893 I had some throat and do not feel at all well. I went to church and Will and I went over to Halsons for dinner. Some of the folks from over home called there. I felt so badly that I took medicine and went to bed about seven oclock.